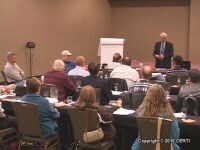 This course is comprised of two separate sessions recorded at the U.S. EPA, Region VIII’s Radon Stakeholder’s Meeting in Denver Colorado in April 2010. This program discusses current practices and alternatives to the installation of radon control techniques in building construction and incorporates valuable comments from seasoned mitigation contractors, engineers and school maintenance personnel who attended this highly interactive program. There is approximately 8 hours of coursework, including video, publications, and online quizzes that are taken as you progress through the course (not timed and may be taken unlimited times). There is no time limit for taking the course, and even after completion you continue to have access to the course in order to refer back to resources. I am very satisfied with the course materials and contents as well as the video presentation of topic 1 thru 4. Listening to the highly technical discussions among the professionals who are directly involved in the installation of Passive and Active sub slab Radon Resistance system has enlarged my knowledge to a higher level. The instructor is very well spoken, commands the class room well. Easy to watch and stay along with him. The course format is easy to follow and can be done one section at a time. The course was informative about appendix F, some of the video was too long, but all information was useful in practice! Basic but a good overall refresher course. As always, very good information. The course was excellent as usual. I have been taking training courses from Mr. Kladder since 1995 when he was with the WRRTC. He has acquired more knowledge as have I over the years. He has always developed, produced, and presented material in a manner that is easy to comprehend and remember. The discussion of the material by attendees yields valuable information just as it always has. I recommend CERTI to everyone I know in the radon business and contractors who plan to build structures that are radon resistant. Actually had some beneficial info for a mitigator with 17yrs experience. I felt that the course info. was beneficial, although it's 6 years dated now. It would be nice to have another "topic" addressing the changes since this was filmed. Materials are easy to use and understand. Answered and clarified many questions I had about the installation of radon systems in new homes. My compliments to Doug for am easy to watch and informative course. The attendees also had good info to share. Excellent learning procedure, to young mitigators like my self. May be the best course I have taken. Very practical Information. Michael said: I recommend this course "5"
I found this course very informative in regards to HVAC systems and mitigation systems. This is a convenient way to accrue category 1 & 2 credits.